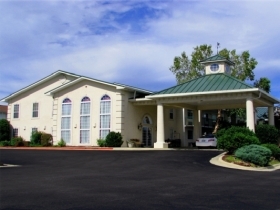 “Days Inn Shepherd of the Hills” is ideally located close to all that wonderful Branson entertainment, yet away from the hustle and bustle of Highway 76. Just down the street you’ll find some of Branson’s biggest shows, like Pierce Arrow and Shoji Tabuchi! There’s so much to enjoy without even leaving the property, including a complimentary Daybreak continental breakfast, heated outdoor pool, and superb in-room amenities. All 90 rooms are spacious and come complete with complimentary Wi Fi and coffee, and HDTV’s with expanded cable offerings. We even offer special suites like our family unit, complete with two bedrooms, a fully equipped kitchen that includes a refrigerator, dishwasher, microwave, stove, toaster, and more. With rooms this comfortable and filled with amenities, you might forget to venture out and enjoy everything Branson has to offer! Shows, attractions, lake activities, shopping...and all of it conveniently nearby!